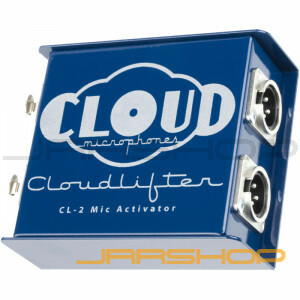 The CL-2 is a dual mono Cloudlifter. The CL-2 offers two independent channels of up to +25db of ultra-clean gain, for passive microphones, inline using phantom power. It’s all about impedance and gain. While some of the best sounding microphones out there are low-output dynamics and ribbons, pre-amplification can be challenging due to the gain and impedance requirements. The Cloudlifters address this by giving passive microphone signals a major inline boost, up to +25db of ultra-clean gain, while properly loading the microphones’ transformer for transparent operation. The Cloudlifter CL-1 is self contained, driven only by the phantom power from your mixer or preamp. Ideal for dynamics and ribbons alike, the CL-1 turns phantom power into the extra gain required for using passive microphones. The immediate dose of extra gain can make even a budget microphone/preamp combination sound clean and professional. For broadcasting and live sound, the active output signal of the CL-1 can prevent added noise over long cable runs. With endless uses, Cloudlifters are quickly becoming a standard addition to professional, project and home studios.